Big Port Harbor Modern (diesel)! "Big Port Harbor Modern (diesel)"
This soundtrack is quiet for the most part, but it always sounds big. There's plenty of 'water traffic' interrupting the calm splashing of waves against the squeaking and creaking wharfs, the distant buoys and fog horns. At one time or another you'll hear almost every type of ship horn and whistle passing by 'somewhere within earshot'. Everything is scratch built into this one, even the wind. Of course, there are a full compliment of seagulls and other critters. 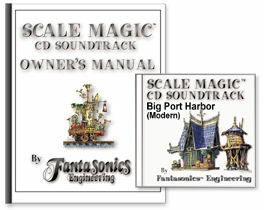 If you model a river front or sea port this soundtrack will create a vivid waterfront, and a huge modern industrial and city background... at tiny scale volumes!